In honor of Veterans Day, the U.S. Army Corps of Engineers today announced it will waive day-use fees for veterans...and their families at the more than 2,400 Corps-operated recreation areas nationwide on Veterans Day, November 11. 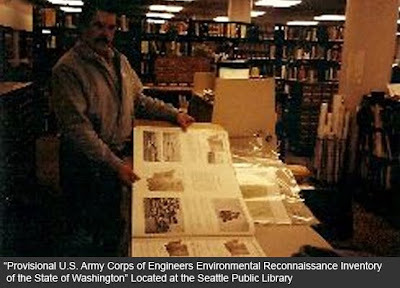 In 1975 the US Army Corps of Engineers published "Environmental Atlas for Washington" Originally titled "Provisional U.S. Army Corps of Engineers Environmental Reconnaissance Inventory of the State of Washington". This monstrous book dedicates a very big and very serious full page to Bigfoot. In fact, the Sasquatch is listed as one of Washington's native species. 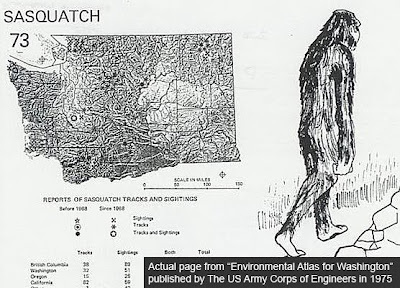 Though conceding that his existence is "hotly disputed," the Army Corps of Engineers has officially recognized Sasquatch, the elusive and supposed legendary creature of the Pacific Northwest mountains. Also known as Big Foot, Sasquatch is described in the just-published "Environmental Atlas for Washington" as standing as tall as 12 feet and weighing as much as half a ton, covered with long hair except for face and hands, and having "a distinctive human-like form." The atlas, which cost $200,000 to put out, offers a map pin pointing all known reports of Sasquatch sightings, and notes that a sample of reputed Sasquatch hair was analyzed by the FBI and found to belong to no known animal. There is a 2nd edition copy (1975) of the Atlas, in the Clark College, Vancouver, WA, library. Above is an actual page from that edition. You can read more details about the Veterans Day fee Waiver at the Corp of Engineers site here. I love their view on it. It's there, it's not a security threat, move on. I agree, very interesting post.